My love of vintage regional independent movies is well-documented at this point. Nothing is quite as exciting as treading into these waters and fishing out some bizarre, shaggy dispatch from the true outer fringes of filmmaking. In many ways, it’s akin to the era’s professional wrestling, which similarly varied from territory to territory: the quality may sometimes be dubious and unpolished, but it’s almost always delivered by a distinctive voice, whether it’s the warbling drawl of Herschel Gordon Lewis or the thick Brooklynese of Andy Milligan. Paradoxically derivative yet idiosyncratic, these are often very weird, singular experiences. Case in point: Malatesta’s Carnival of Blood, which doesn’t arrive out of early-70s Pennsylvania so much as it floats in like a half-remembered transmission from a long-defunct UHF channel. Its plot is more of a suggestion of a premise: the Norris family arrives at a podunk amusement park looking to join its bizarre troupe of carnies, which includes everything from a mischievous, unhinged dwarf (Hervé Villechaize) to a creepy groundskeeper sporting a hook in place of his hand. Led through the grounds by a man simply known as “Blood” (Jerome Dempsey), they’re expectedly skittish, and with good reason: before their tour even ends, the camera wanders off to capture another family’s ill-fated voyage into the tunnel of love. When this clan doesn’t emerge on the other side, the ride attendant finds that they’ve mysteriously vanished, leaving only traces of blood on the walls. Something very strange is afoot. The rest of the film isn’t exactly concerned with unraveling the mystery; rather, director Christopher Speeth further drowns audiences in the hazy nightmare logic of the film’s barely-connected sequences. A passenger loses his head on a roller-coaster; overly-curious wanderers stumble about the grounds, only to be gutted, their bodies fed through a mysterious chute; a throng of cannibals awaits below, lorded over by the titular Malatesta (Daniel Dietrich), a mustachioed cult leader about two steps removed from The Master in Manos. Our only tether to any sense of reality is Vena, the daughter of the newly-arrived Norris family. Her parents keep hinting at exacting some sort of revenge against the carnival, but even this thread is eventually dropped in favor of a loose, free-flowing descent into the bowels of the park. Much of the film recreates the sensation of struggling to breach the surface of a bad, suffocating dream, and this stretch especially submerses both Vena and the audience to a parade of bizarre sights. Malatesta’s horde sprawls about the floor, enthralled by both Vena and the classic horror movies projected on the wall of their dim, dingy lair. Caligari, Nosferatu, The Hunchback of Notre Dame, and Chaney’s Phantom unfold in the background, often casting these ghouls in silhouette, connecting this grungy contemporary horror show to the genre’s more elegant past. Lost in this unreal, funhouse underworld, Vena becomes the latest nightgown-clad damsel fleeing monsters and demons, only her plight is more perilously grisly and blood-soaked in away those classic films weren’t. Malatesta’s Carnival of Blood approaches the intersection of refined gothic horror, scummy drive-in exploitation, and Eurotrash fever dreams; rather than do so cautiously, it plunges headlong, creating a messy but compelling collision, leaving viewers to sift through the malformed wreckage. If Jean Rollin and Andy Milligan had ever collaborated on a movie, it might look something like this: dreamy yet startlingly lucid; surreal, yet somehow vaguely identifiable in its Americana trappings. Its warbling pipe organ and ghouls recall Carnival of Souls and Night of the Living Dead, but its bright, heightened splashes of 70s-flavored crimson capture the growing tide of explicit gore movies. Speeth settles neither here nor there, opting instead to flit in between modes: one moment calls for a moody, Dracula-esque shot of a shadow swallowing a trailer*, while another requires a shot of the messy remains of a crude decapitation. Taken as a whole, the films stands alongside many of its contemporaries: Malatesta’s Carnival of Blood will remind you of a half-dozen movies, yet still manages to feel like a distinct experience. Aided by the authentic desolation of this hole-in-the-wall amusement park, Speeth all but strands his audience in the middle of nowhere, nudging them further and further down a psychotronic rabbit hole. By the end of the film—when he’s made it abundantly clear that there’s no coming up for air after all—he’s distorted reality so thoroughly that you can’t escape its peculiar rhythms. It’s like waking up from a nightmare only to realize you’re still trapped inside, locked away in the dusty, unseen corners of funhouses and log flumes, as these illogical spaces transform into the stuff of childhood fears writ large: you don’t dare stray into these forbidden zones, lest you lose your head—or even more. *Of course, even this moment of elegance is marred by the actor’s arm unexpectedly jutting into the frame, causing the camera to shift over in the hopes the audience didn’t catch the gaffe. Despite this, the film still isn't nearly as cruddy and amateurish as the other Carnival of Blood. It’s no surprise that Malatesta is so obscure that it was thought to be lost for about three-decades. 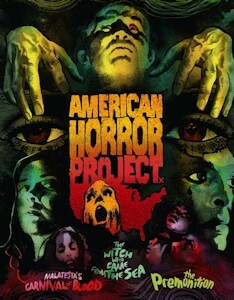 After a limited run through the drive-in/grindhouse circuit in the early 70s, the film all but disappeared until a print was located about ten years ago. That discovery paved the way for an official DVD release that now yields to a Blu-ray upgrade at the hands of Arrow Video, who has included the film in its American Horror Project Vol. 1 box set alongside The Premonition and The Witch Who Came From the Sea. Malatesta’s Carnival of Blood fares well in the supplements department, as Speeth, screenwriter Werner Liepolt, and art directors Richard Strange and Alan Johnson appear in various interviews to reminisce about the production. Speeth is especially candid: while he’s still proud of the film, he can’t deny its warts—not that he should, especially since these “flaws” create so much of the film’s personality. Other extras include a commentary from film critic Richard Harland, a photo gallery, and outtakes from the film’s original, more explicit cut. Speeth’s distributor mandated an R-rating, so cutting these gruesome sequences were necessary to avoid an X; it’s too bad, too, because these indulgent scenes only add to the ghastly tenor. Speeth’s interview also contains the disheartening nugget that the amusement park used in the film has since been demolished, though that somehow adds to the film’s lore—this is truly a transmission that feels like it barely clawed its way out of a different, long-gone era. What’s more encouraging is Arrow’s “Volume One” designation for this release, as it implies further collections are on the way: considering this particular set has hit my personal sweet spot, I can only look ahead eagerly for more strange dispatches from this time.